Sun Xi Kun 孫 錫 堃 (1883-1952) was one of the few disciples of Cheng You Long (also called Cheng Hai Ting), the oldest son of Cheng Ting Hua. Sun’s book Ba Gua Quan Zhen Chuan (Genuine Transmission of Ba Gua Zhang) is one of the few records of Chen You Long’s method, including Ba Gua Zhang training methods. The below excerpt on Ba Gua Zhang training methods is from “The True Transmission of Ba Gua Zhang”, by Sun Xi Kun. “In training this boxing art, it is necessary to use various training methods. One method is the standing pole. This pole stands about two meters in height, with another meter buried under the soil. The pole is wrapped in bamboo fencing on all sides. The top section is a meter long and there are transverse poles (cross-poles) which are the thickness of a wrist and a half meter in length. It is like a wooden man. Move freely around it with advancing and retreating steps, employing various striking methods. 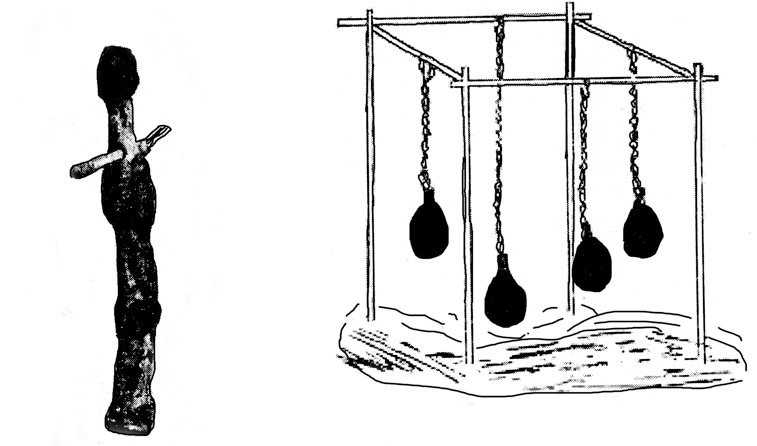 Another [training] method is to strike a hanging basket, which is loaded with iron sand or mung beans inside and which hangs with a rope from a beam. In the beginning, the basket is only about five kilos in weight. Afterwards the weight can be increased gradually. The basket is wrapped with the cotton and sewn with coarse canvas and is hung at the level of the heart. It is used for training bumping and striking with the two hands. Use embracing palms and elbow strikes. Strike with the shoulder, or with the kua (thigh and hip). Once one is familiar with these striking methods, hang two baskets. When one is proficient with two baskets, hang four baskets. Stand in the middle and hit rightward and leftward.